Inheritance (directed and written by Tyler Savage) was an interesting film in that while it deals with the supernatural it never really shows much, instead it insinuates and dances around the notion that the main character and his bloodline may be cursed. I found this method to be refreshing, the pervasive sense of something not quite right impacted on most scenes here. Much of this 90 minute film doesn't really have any obvious horror to it, yet a combination of the soundtrack and an ever present sense of something not quite being right adds a lot to even the most innocent of scenes, such as when Isa and Ryan visit a local shop, or when a realtor pops around to ask them about selling the house. Dream sequences are mixed in with the rest of the film but are never addressed with it not being apparent if these are for the viewer or if they are hallucinations that Ryan is getting, though I guess he does get directly addressed by these 'ghosts' at points. With half an hour left this shifts gears into something more approaching traditional horror, culminating in a great sequence that really ramped up the tension and left the viewer guessing. Even then this is just the one scene, but a powerful one helped by some stand out cinematography and some clever editing. It baffled me slightly though how this got an hour in and still nothing had really happened, yet it didn't feel like it was dragging, and it didn't feel like this was a slow burn, kind of hard to explain. Of the two main actors I felt Montez was better at showing subtle emotions, but I also liked the character arc of Joliet's Ryan. He plays a brooding character who does go through a range of emotions, though he never seemed particularly happy so it was hard to get behind him too much. It was really fun to see Drew Powell (Gotham) as a side character, enjoyed every scene he appeared in, while I also found Dale Dickey's small part as the realtor to be enjoyable. Thinking about it there wasn't a bad actor among the lot, better than I expected. The plot was simple, but clever in how it pans out, the title of Inheritance became quite clever in that it isn't until late into the film that you come to realise what that word is actually referring to. There were some parts I never really understood that well, mostly some of the dream sequences that had Ryan in places or positions past family members had been in, though it was good that these people from different time periods seemed to be hanging out in some sort of ghostly limbo, guy with the huge moustache was my favourite. I really enjoyed the roundabout way Inheritance deals with a curse, the origins of which are only hinted at via old photographs, visions/dreams that Ryan has, and a local legend about the area a neighbour tells him about. There is a sense of The Shining in that he is slowly getting his will chipped away, the ghosts of his family's past not able to do much more than observe. Up until near the end I wasn't exactly sure what was going on, but then it just clicked for me and I was able to infer the true horror. Inheritance isn't about grand spectacle, intense action or jump scares, instead it tells a classic story but with a restraint that gives layers to what is unfolding. The explanation for just what is going on is never shoved down your throat and with enough crumbs to follow it is fun to piece things together. Something a little different to what you would normally expect but this wasn't bad. 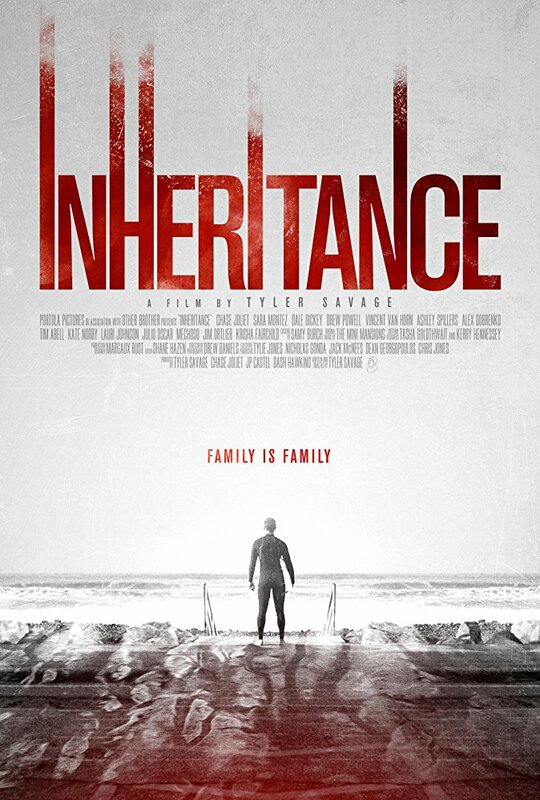 Inheritance is being released by Portola Pictures on iTunes and Amazon Instant Video on June 15th. Scary and deep. Loved this film. Although sometimes it seemed a bit deliberate, it has a tremendous payoff, very worth the wait. Very much like "The Shining."